Get Your SPARK Back is a 1:1 or group program for individuals and teams who desire a balanced, successful and fulfilled lifestyle. For those who want to lead a life in alignment with their purpose, their team and companies purpose and be happy, successful and fulfilled in life. For those who want to feel self-love, energy, and passion again. For those who want to let go of limiting conditioning, stress, fear, and perfectionism. It is a transformative coaching package where I teach you to take the time to let go of carrying the weight of your job, family, the world on your shoulders, have an unshakeable mindset, focus on self-care to recharge and be self-full so you can truly live a life you love. 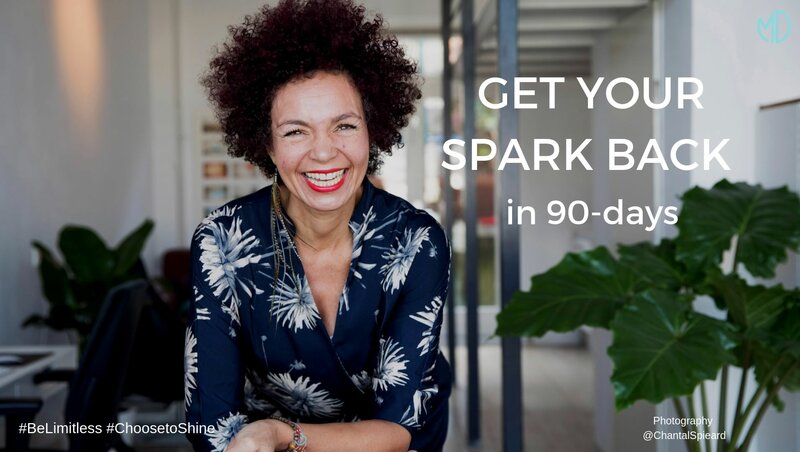 In 90 days you’ll Be Free of stress, Free of Limiting Conditions, Free of Perfectionism, Energized, Happy and Fulfilled in all areas of life. Other bonus materials that help you Get Your Spark Back. We explore your current situation, flying high and zoom in and out to get to the root of the issue. In this stage, you learn to nourish empathy towards yourself and your surroundings. What’s your vision, your purpose? What is the vision of your company or team and how can we align the two? Awareness of what is limiting you and where it comes from is key to get insights into yourself. Through personality tests that reveal your subconscious drivers and behaviors and our 1:1 calls, we’ll unravel your unconscious blocks and strengths. You’ll achieve clarity on where you are now in life, your balance, your current state, and your desired outcome. Then I'll give you all the resources you need to become successful and create the results you want, whether that is in your job, your team, your company, relationship or your life. You’ll nourish an unshakeable mindset, build a strong fundament to be the new energized, powerful and happy YOU. It is you that has to change from within, you can never change your external environment. When you change your beliefs and values you’ll change your life. You’ll get insights into what is motivating you, what gives you energy and your values and beliefs will be aligned in the light of your new choices. You already have everything you need inside you. All you have to do is acknowledge, accept and step into your core power, your greatness, your genius again. To transform and Get Your Spark Back, you have to take care of yourself and let go of what no longer serves you. You’’ll work with powerful beliefs that will help you to make the next steps in your development. You’’ll release negative emotions and limiting beliefs and create new empowering patterns and beliefs to create long-lasting change. You’ll be in rapport with your Subconscious Power, feeling the energy and passion return! A ship without direction won’t reach its destination. You'll follow the secret to creating your future, a nine-step process that also integrates your goals into your subconscious mind so quantum physics can work its magic for you. You'll work with the power of focus to get your desired result and final alignment of all you’ve done in the program to finally have that real SPARK back in your relationship, your work, your life. Going through all the 5 steps you are ready to unleash your sparkle, live life from the heart, connected to yourself, your loved ones and in alignment with your purpose. Happy and Fulfilled from within. My coaching program provides you with a bonus welcome strategy call of 120 minutes, to elicit your current and desired state and to give you the outline of our journey together. You can immediately start with my bonus daily power rituals to tap into your subconscious power. To create real and long-lasting results and create sustainable empowering new patterns you’ll have weekly 1:1 coaching sessions of 20 minutes over the 3-month period. You will have UNLIMITED email access to me to address any questions you may have or provide feedback on any area you are working on. On completion of this program, you will be able to join my exclusive Facebook Mastermind Support Group for further connection, love, accountability, community & support. Last but not least you'll have Lifetime access to resource materials and access to my personal mindset breakthrough reading-list. Real accountability, connection, fun, care & support – I will give my all! Enrollment for this PREMIUM program is by application only and complimentary Discovery calls are available on a first come first serve. There are limited spaces available because I want to make sure I give you undivided attention without having to rush off to the next client. To book a free discovery call with me, please click on the link below. Book your free 50-min Discovery Session.